In a bid to outpace competitors in the emerging segment, online grocery platforms such as Grofers, BigBasket, Amazon Pantry have been rolling out discounts and cashbacks. The latest similar offer comes from Grofers who are claiming to give 100% cashback. 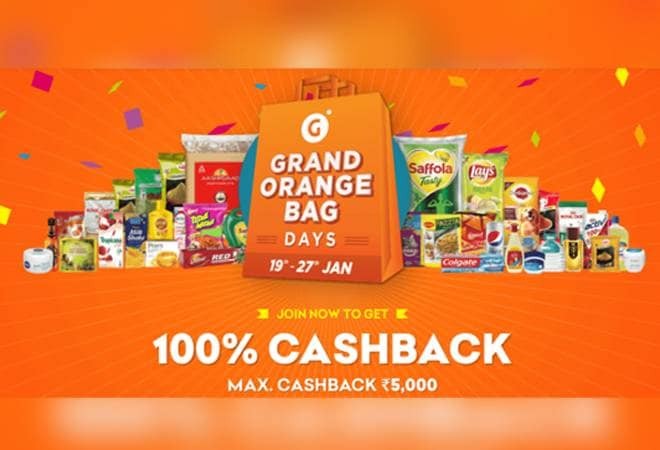 Called the Grand Orange Bag Days, customers will have to join the programme to avail the cashback of up to Rs 5,000. Customers who are looking to join can simply go to the site and pay Rs 50 as the joining amount. The deadline to join the programme is three days and four hours from now, i.e January 12. As per the company, 2,33,525 people have already signed up for the sale programme. Once you sign up and join the Grand Orange Bag Days, you can place an order between 19th and 27th January. Once the order is placed, Grofers will give you 100% cashback up to Rs 5,000 within 6 to 12 hours from delivery. Customers can use that cashback to pay for 20% of any order of value more than Rs 1,000 after January 31 till December 31. There is no minimum requirement to avail the cashback. The maximum cashback of Rs 5,000 can be availed on one or multiple orders. Grofers is also rolling out additional benefits such as 'Deals at Re 1', 'Buy 1 Get 1 Free', and 'Minimum 50% off'. Based out of Gurugram, Grofers was founded in December 2013. Co-founded by Saurabh Kumar and Albinder Dhindsa, Grofers has bigwigs like SoftBank, Sequoia Capital and Tiger Global as its investors.